Check out our Mexican Enchiladas Recipes section! 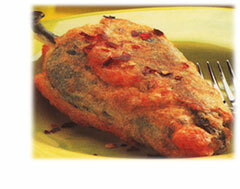 Authentic Mexican Chiles Rellenos, and many other dishes are historically prepared using poblano chiles. In the United States, we usually see Chiles Rellenos made with the lighter green, longer and more slender Anaheim chiles-but these are not as flavorful as the poblanos-and they're certainly not the "real deal." Fresh poblanos can be difficult to find unless you live in the southwestern states, especially since in California they're often mislabeled as Pasilla chiles in the grocery stores. However, there is an easy remedy to all this confusion. Canned poblanos are available right here on mexgrocer. Actually, canned poblanos are delicious and easier to cook with than fresh, because they don't have to be blistered. 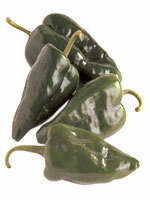 You can use them in any recipe calling for poblanos - or for Anaheim or green chiles. What does a poblano look like Well, it's pretty big-about four or five inches long and two or three inches wide. Its walls are denser than an Anaheim, and its color varies from a medium-dark green to an almost black-green. It's not a hot chile, which makes it perfect for dishes like Chiles Rellenos and Rajas. When poblanos ripen, the dark green ones turn to dark red in color. When they dry, they become flat, wrinkled and a blackish-brown in color. At this point they're known as an Ancho chiles. After soaking in water (for sauces) the ancho turns brick red. The blackish-green poblano ripens to a dark brown color. When it dries, it also becomes flat, wrinkled and blackish-brown. However, once soaked it turns brown. It's then called a Mulato chile. Poblanos originated near the city of Pueblo in Mexico and the native Indians cooked with them long before the Spaniards showed up in the New World. However, the foreigners quickly embraced these chiles and integrated them into their cuisine. Nowadays the poblanos are cultivated in arid, semi-desert valleys throughout central Mexico. In the spring and summer, the prime producers are the states of Guanajuato, San Luis Potosi, Durango, Aguascalientes and Zacatecas. During the winter months, the chiles are harvested in Sinaloa, Nayarit and Jalisco. The recipe for this enchilada sauce uses dried poblano chiles, or anchos. While mole can be made from scratch, it's far easier to buy it here at mexgrocer and go from there. You won't sacrifice any taste. This makesa dozen enchiladas, or enough for four to six people. It takes approximately a half hour to prepare. You can serve this as a main course, or as part of a Mexican Combination, with Chiles Rellenos (see below), Mexican refried beans(frijoles) and rice, and a side of cabbage salad. Combine mole paste, chicken bouillon, slivered almonds and chocolate in blender or food processor. Process until smooth. Heat 1 tablespoon oil in a medium saucepan. Add mole paste mixture. Bring to a boil; reduce heat. Simmer uncovered until slightly thickened, about five to 10 minutes. Heat remaining oil in a medium-sized skillet. With tongs, carefully place 1 tortilla at a time in hot oil. Hold in oil 3 to 5 seconds until softened. Quickly turn tortilla and soften other side, 3 to 5 seconds, then dip in mole sauce to coat. Lay each coated tortilla on a plate and place a scoop of chicken on it. Roll the tortilla tightly around the chicken and place, seam-side down on a warm platter. Put in warm oven to keep from getting cold. Repeat with all remaining tortillas. Pour remaining sauce over enchiladas. Sprinkle with crumbled cheese and sesame seeds. Serve immediately. This delicious variation on a traditional recipe will make enough mouth-watering rellenos for three people as a main course, or six people if you're serving with Enchiladas or as a side dish to another main course. Allow an hour to prepare. A bit timely, but well worth the effort! To make the sauce, combine tomatoes, onion and garlic in blender or food processor; puree. Heat oil in a medium saucepan. Add tomato mixture. Cook 10 minutes, stirring occasionally. Add bouillon, salt, chiles, cloves and cinnamon. Simmer over low heat for 15 minutes. Set aside and cover to keep warm. Cut a small slit in one side of each chile. Remove all seeds. Do NOT remove stems. Pat chiles dry with paper towels.Cut cheese into 6 long slivers. Place a sliver in each chile. (You may want to use a bit larger slices of cheese if the poblanos are on the large size.) Add 1/6 of the chopped walnuts into each chile. Pour oil inch deep into large skillet. Heat on medium to high until a drop of water fizzes when you put it into the oil.Beat egg whites in a medium bowl until stiff. Slightly beat egg yolks in a small bowl. Add to beaten egg whites, folding in quickly, lightly and thoroughly. Roll each in flour, then dip it into the egg mixture to coat. Fry in hot oil until golden brown, turning with a spatula. Drain on paper towels. Serve immediately, spooning the tomato sauce on top of each relleno. If you want to roast your own chiles, place them in a 9 x 14 pan in the broiler. Broil until lightly charred on both sides. Remove from oven and seal immediately in a plastic bag for 10 minutes, so that they can "sweat" and the skin becomes loose. Wearing rubber gloves, peel the chiles and rinse. Be careful not to tear them or loosen the stems. Make a small slit on one side of each chile. Remove all seeds and set aside. To make the filling, mix the shrimp, apples, slivered almonds and mayonnaise together in a medium bowl. Stuff the chiles with the filling and close the slit. Blend the remaining ingredients in a blender until smooth. Add a little water if necessary so that the consistency is that of a vinaigrette salad dressing. You may need to add a little water. To serve, line six salad plates with a romaine leaf. Sprinkle with vinaigrette and place chile in the center of each plate, slit side down. Serve immediately, or within 20 minutes. This dish is fine at room temperature. This is one of my favorite recipes. It is wonderful scooped up with fresh, hot flour tortillas, with a side of salad and perhaps rice and beans. It takes about two and a half hours to prepare, but it isn't that labor-intensive. Besides, the leftovers can be made into omelets the next morning! Serves four to six. Heat 2 tablespoons oil in a large skillet or Dutch oven. Add meat. Cook until browned. Add water. Cover and simmer on low heat for an hour. While meat is cooking, place both Ancho and New Mexico chiles in a medium saucepan. Add enough water to completely cover them, and bring to a boil. Remove pan from heat immediately, and let stand uncovered, until softened, 45 minutes to an hour.Drain chiles. Discard stems and seeds. Place chiles in blender with about 1/2 cup cooking broth from meat. Blend until pureed. Add pureed chiles to meat and broth. Place garlic, 1 tsp oil and salt in food processor. Process until you have a garlic paste. In medium skillet, combine garlic paste and and onion. Cook until onion is very tender, but not browned. Add flour. Cook and stir one minute. Add onion mixture, oregano and cumin to meat and chile mixture. Cover and simmer 1 1/2 hours. Taste and add more salt if needed. Try this recipe. The poblano chile strips, cooked in sour cream are divine and go beautifully with any chicken, beef or seafood dish. Serves four and takes about 30 minutes to prepare. Melt butter in skillet. Add onion and cook until translucent. Add chiles, salt sour cream and crean. Stir until heated clear through. Remove from heat and serve immediately, garnishing with grated cheese.